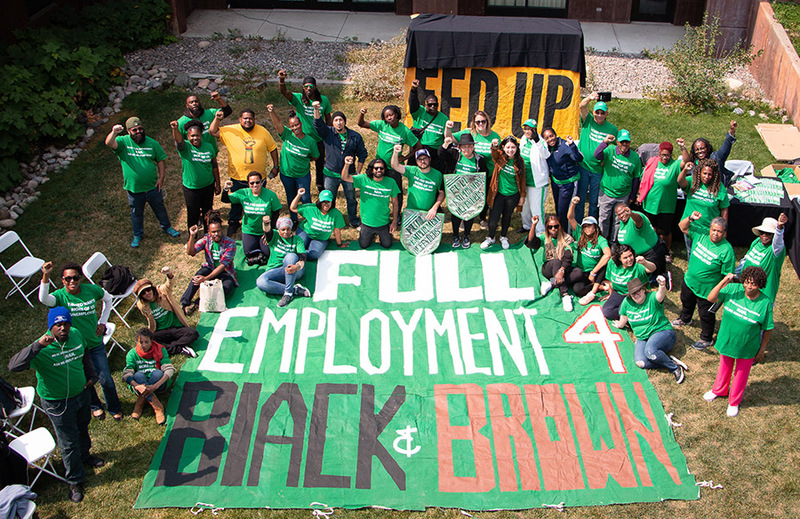 For the fifth consecutive summer, CPD and Fed Up activists travelled to Jackson Hole, Wyoming -- where the world’s most powerful economic policymakers gather to discuss the direction of the global economy. The topic of this year’s symposium was corporate concentration and its effect on wages. The Fed has said flat wages are a “puzzle,” and Fed Up arrived in full force with over 50 workers of color from across the country, activists and academics to give them the answer to that puzzle: corporations have too much power, workers don’t have enough power and that imbalance is keeping wages low. CPD affiliates including SPACES DC, Action NC, New Georgia Project, New York Communities for Change (NYCC), Make the Road New York, Missourians Organizing for Reform and Empowerment (MORE), and Organization United for Respect (OUR), made sure the Fed could not ignore this obvious truth as they chart the future direction of the economy. On August 23, CPD’s Fed Up team kicked off the event with in-depth popular education including a Full Employment Defense workshop focused on corporate concentration: big corporate monopolies, like Amazon, growing more powerful and keeping workers' wages low. Following the training, Fed Up hosted a panel in the designated “First Amendment Zone” outside of the Jackson Lake Lodge where academics and workers discussed how market concentration keeps wages down and, importantly, how that means the Fed should let unemployment get significantly lower before raising interest rates. On Friday, Fed Up members led tours and activities across the Jackson Hole Lodge to occupy the same space as the most powerful people in the economy and fill it with their stories about how they still haven’t recovered from the last financial crash. When Fed Up first came to Jackson Hole, we were called protestors who were disrupting the Fed’s meeting, then activists trying to push our agenda. This year, for the first time, our coalition of workers of color were considered “experts” whose views shaped the most important economic conversation in the country in this moment. The coalition was featured in Reuters, CNBC, The New York Times, The Washington Post, and The Wall Street Journal, among others. Visit CPD Action’s Facebook page to hear directly from the workers who joined Fed Up in Jackson Hole and follow the hashtag #10YearsAfter.